Another update is here and now you can climb to your hearts content! Today we are introducing the brand new climbing system to Conan Exiles. You can climb almost anywhere in the game, so feel free to climb up mountain sides, ruins, walls or trees. Just hit space when you reach a steep surface and you will start climbing. This climbing system allows you to explore the map in a completely different way, so now it will be much easier to enjoy stunning vistas of the Exiled Lands. It costs stamina to climb though, and if you run out you can’t climb anymore. This makes climbing great heights quite dangerous, as it can mean plummeting to your death if you run out of stamina before reaching the top. The heavier armor you wear the quicker you use up your stamina while climbing, but you can get your hands on special climbing boots and gloves, which will greatly increase the distances you can climb. To learn how to make this special climbing gear you will need to find the mountaineer. Only he can teach you the recipe and he is located high up on a peak, which is quite difficult to climb. This new climbing system can make attacking cities easier, but there are still plenty of defenses against climbing intruders. If you take damage while climbing you will immediately fall down (and sometimes this fall damage will kill you), so if defenders have archer thralls which can hit you when you climb, you will not be able to climb into their base while they live. Reinforced Stone Fences (tier 3) and Crenelated Walls now have spikes which do damage, so they make an excellent defense against climbers. Place them at the top of walls, and nobody can climb over them without taking damage and therefore falling down. Conan Exiles now has an all new exploration system! The map has tons of points of interest and every time you discover one of these it gets marked on your map and you gain experience points. There are many points of interest spread all over the map, from cave entrances to ruins, NPC camps and unique locations. 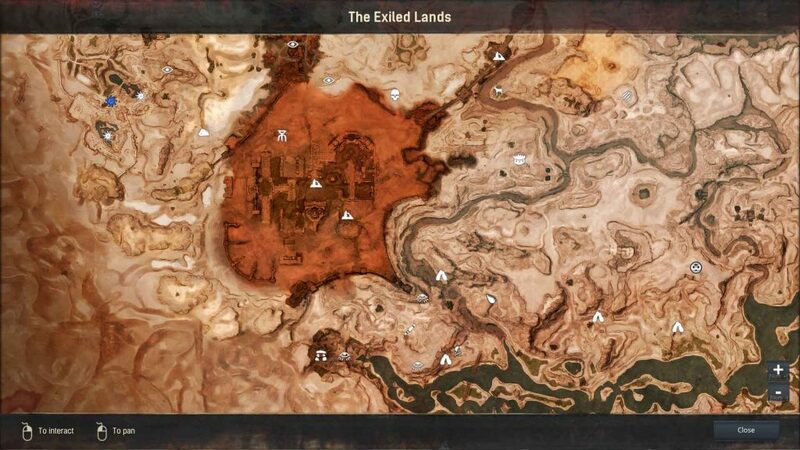 As you explore you do not only put lots of markers on your map, and gain XP, but you also learn the names of all the points of interest in the Exiled Lands. You can make custom markers for your map and name then as you see fit. This can be very helpful if you wish to mark locations you need to remember, or perhaps places of danger you wish to avoid. The update also contains several other improvements, such as haziness when stamina is depleted, reticule dot in the center of the screen (can be turned off in options), and as the first step in a move to adjust progression the XP curve has been adjusted (you now require 20% less XP to reach max level). Read the full patch notes for the update here.